Black Combe is a lonely outpost, tucked away in the southwest corner of the Lake District. No other fell reaches 600m before you reach Harter Fell, nearly 17km away. This isolation has its advantages. 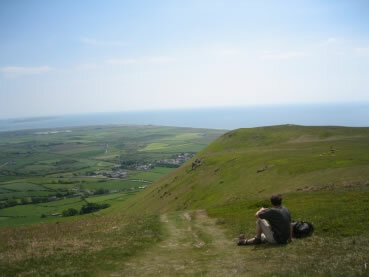 William Wordsworth described the views from Black Combe as ‘the amplest range of unobstructed prospect may be seen that British ground commands’. Which is poet-speak for ‘nice views’. And he had a point – it’s a fantastic vantage point, whichever way you look. To the north and northeast is a panorama of famous, including the Scafell and Coniston groups, with the Yorkshire ‘three peaks’ also visible. In fact, view-spotters claim that fourteen counties can be seen on a clear day, as well as Scotland and the Snowdonia hills. On the remaining sides are sea views – the vast sandbanks of the Duddon Estuary looking southeast, and the Irish Sea to the south and west. Despite the location and relatively modest height – 600m fails to earn Black Combe a place on some people’s tick-lists – it is no elusive ‘hidden corner’ – the well-trodden paths from Silecroft and Beckside are proof that it gets its fair share of visitors. Where most of them go wrong, however, is by targeting the summit shelter and then trudging back the same way to the car. A strange idea for a walk at the best of times, but especially considering there is plenty to explore to the north. And the Cumbrian Coast Line, which follows the southern curve of the fell, makes linear routes easy to plan. The route described here starts from Silecroft station. 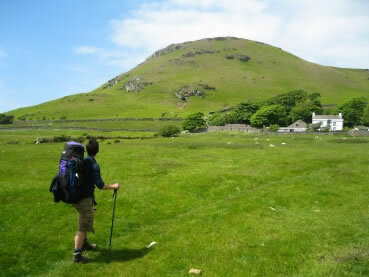 After passing through the old mining village (there are several old shafts on Black Combe), take the path from Kirkbank. This track cuts through the swathes of dark brown heather on the south and western slopes that give the hill its name. At the summit shelter, head across the open land to the northeast. As the path heads past Blackcombe Screes and over Hentoe Hill, it thins out and then fades into the moorland surroundings of Swinside Fell. Take time to wander about for a while and appreciate that poet-inspiring panorama. This is an area often overlooked by those leaving the car at Silecroft, Whitbeck or Beckside, so you may even find your hidden corner. Beyond Whitecombe Head, there is a choice of descents. 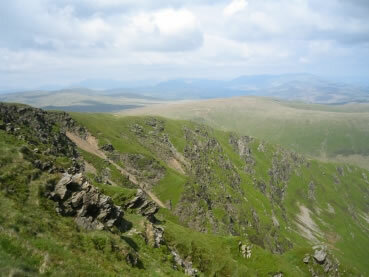 The most distinctive feature of the group is the vast corrie northeast of the summit, and the path running along Whitecombe Beck offers a close-up view of this impressive face. For an easier way down, take the path along the spine of White Combe, with a quick side trip to White Hall Knott for the photo opportunity. My preference is to stay on the high ground for just a little longer and take the path running down the southern slope of Grey Stones. For those who like to really ‘do’ a hill, continue northeast past Black Crag and Raven Crag to descend via the Swinside bridleway. Whichever path down you take, there is still a bit of a walk to Green Road Station. This happens when you take the train – while parking spots can be squeezed into the nearest space at the foot of a hill, train stations are where they are. But this final leg allows you to dip your booted toes into another side of the Lakes. The villages and hamlets contain no gift shops, outdoor shops or tea rooms; instead, you will pass quiet houses and busy working farms – where the dogs have very authentic barks – via footpaths that are marked on the maps and signposted on the ground, but clearly rarely used. The place names alone make it worth the effort. The route from Grey Stones passes Whirlpippin, Dunning Well and Brocklebank Wood – names straight out of an Enid Blyton adventure. Luckily The Punchbowl Inn near the station serves more than fizzy pop and ginger beer, so you can enjoy a pint with views of Black Combe while you sit and wait for the train. A version of this article first featured in The British Mountaineering Council's Summit magazine.